Graham Page won the PDAA match. It was a big weekend for those fishing the last round of the King of the Fens League on the Middle Level at Magdalen to St Peters Bridge. Going into the match Sensas Mark One Black had a slender lead over Huntingdon-based Browning Hotrods, so there was all to play for at the start of the day. Ray Torrington won the Deeping match. But as the results came in it was clear to see that the Mark One lads had slipped up and that left the way clear for Hotrods to steal the show. In fact they dominated the day topping the field with a fine 31-point scorecard and took the league title by two points. On the individual front there was certainly consolation for the Mark One side as one of their most consistent anglers, John Taylor, took top spot with 15lb 2½oz and that win was enough to give him the overall individual title with 37 points and a combined weight of 43lb 8oz. Kye Jeromewas runner-up spot with 12lb 11oz, followed by Rob Hewison on 11lb. Teams on the day: 1 Browning Hotrods 31pts; 2 Top Guns 25pts; 3 Boston AA 24pts; 4 Lynnkenwill 23pts; 5 Sensas Green 21pts; 6 Sensas Mark One Black 20pts. League Overall: 1 Browning Hotrods 8pts; 2 Sensas Mark One Black 12pts; 3 Sensas Mark One Green 19pts; 4 Boston AA 19pts; 5 Lynnkenwill 20pts. The Tuesday Club are really starting to get about for their midweek matches, using waters that have hardly been match-fished for many years. The latest was just above Bedford gravels along the top end of the North Bank and with plenty of fish showing they are sure to be back on this once very popular section of the river. Leading the way was Jim Inwood, who caught on the straight lead with sweetcorn catching two good bream for 9lb 6oz. Runner-up with a net of small fish taken on a long pole line was Alan Jopling with 7lb 10oz, followed by Roger Biddle with 6lb 9oz and Mike Smith on 6lb 4oz. Yet another Peterborough DAA match on the Orton Downstream section of the River Nene saw the in-form Graham Page show he has lost none of his touch on the river. He won with 7lb 10oz of roach caught on hempseed to see off the challenge of Nigel Briggs, who also fished the pole with hempseed to finish on 6lb 11oz. Third place went to Dave Norville, he caught perch and a big eel for 5lb 6oz. 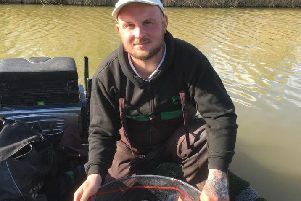 Deeping St James AC fished Lou’s Lake at Decoy Lakes for the second round of the Wade Cup. On a bright, sunny, warm day the winner was Ray Torrington on peg 10. He started off on the short pole fishing pellet, where he caught small carp and skimmers. Then he finished up in the margins, fishing cat meat just off the bottom for a total weight of 146lb 11oz. Second was Chris Wheatley on peg seven with 119lb 13oz. Third was Dave Marzell on peg six with 93lb 2oz. Buttonhole Fishery has been in great form recently and it didn’t disappoint the Webb’s AC anglers on Sunday. Out in front was Alan Forrest, who caught on prawns for 122lb 14oz. Runner-up with 106lb was Marcus Webb, and then came Andy Parry on the feeder for 83lb 11oz.